Spain’s midfielder Iniesta has given an indication of ending the spectacular career of international football at the end of the World Cup. In a statement the midfielder mentioned that he could be retired from international duty after Russia WC 2018. That means this being the last championship of the Spanish man, after that he going to say goodbye to international football. In the national team since 2006, he started capturing himself, since Iniesta it will be remembered as one of the most important players in the history of the country’s football. Without any confusion the Barca star one of the best footballer in Spain team and his retired really a bad news for all the supporters and country. 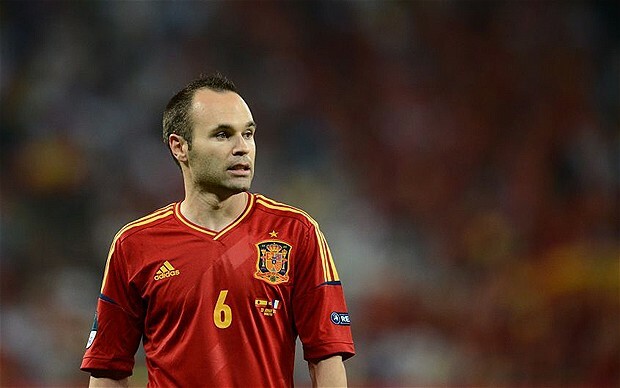 The 33-year-old Iniesta played 123 matches in Spain’s jersey until Germany reached the friendly match on Friday. Andoni Subşereta, Chavi, Sergio Ramos and Ecker Cassius played more matches than the country. Iniesta, who has played all the preparations for Spain before the World Cup, and can take the team to the finals, can go beyond the third place in the list of the most matches for the country. The 33 years man always played fantastic for the native side. He gave his hundred percent when the country needed him. Regarding his career in international football, Iniesta told to Spain’s Radio Kadena Serek that it seems that at that moment, he will play for the last time in Russia World Cup. The midfielder could not elaborate his conversation. With that speech it has been imagine that he could retired from international duty after the championship. Iniesta, one of the most successful era of Spanish football history. In 2008 and 2012, he contributed the team twice to the European championships. The Barca man was one of the most important members of the 2010 WC championship winning in Spain team. He scored the only goal against the Netherlands in the final. And that was amazing. And finally they won the trophy. Not only for country side, the club record of the Spanish man being too good. The mid man linked with Barcelona since 2002. In 2013 he signed a five year contract with the club which keep him attached with the side till 2018. But last year the man signed one more contract which will keep him with the club in lifetime. The Barca guy always considered as one of the best footballer so far. His unique playing style embarked him as the greatest guy of the time being.